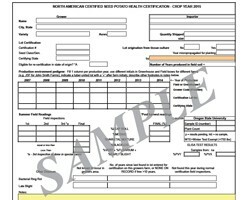 The emergence of Potato Virus Yntn, which causes tuber necrotic ringspot disease (TNRD) in susceptible varieties, and the emergence of blackleg Dickeya, both serious seed-borne diseases, are very important reasons why you need to get a copy of the North American Certified Seed Potato Health Certificate (NACSPHC) for each lot of potato seed you buy. About 20% of the PVY in the North American seed crop is currently PVYntn. 25% incidence of TNRD occurred in a local grower's crop from one field, resulting in very high losses. It is reported as "Mosaic" on the certificate, which includes all the PVY strains. Only buy seed lots with a very low percent of mosaic. Aphids can spread the disease from a non-necrotic ringspot susceptible "carrier" to a susceptible variety on your farm. From Meg McGrath, 8/25, Long Island Fruit & Vegetable Update - Brown leaf spots and necrotic leaf veins in the early, European variety Nadine this season were confirmed to be caused by PVYNTN. See photos of these leaves and of a plant with more typical mild symptoms, plus information about PVY. Also see images of the brown necrotic ringspots on tubers of a susceptible variety. In other varieties PVYntn only reduces yield, causing plants to produce fewer and smaller tubers. Read about varietal susceptibility to TNRD. Common bacterial blackleg and the new, much more virulent bacterial blackleg Dickeya (BBD) aren't distinguished on the NACSPH Certificate, but are reported as "Blackleg" at this time. About 30% of potato stems in one local field wilted and died from BBD in 2015. Four fields were confirmed positive in the CVP region in 2016, and more fields were suspected. Plant pathologists are recommending that growers adopt 0% tolerance for blackleg in their seed. If any BBD was seen in a field this year check carefully for rotting tubers and the "shells" of tubers that already rotted, before harvest. Also note if yield was less than expected. 2016 incidence of BBD in Eastern and some Midwestern fields were traced to 11 ME seed producers and 2 New Brunswick, Canada, producers, of Reba, Superior, Vivaldi, Norwis, Snowden, Yukon Gold, Beacon Chipper, Kennebec and Atlantic.